Here's a handy reference to some of the terminology commonly used in gunpla and modeling communities. 'twas written by Sonar over at the Gundam Australia Forum and used with permission. Be sure to check out the thread where this all started as it may have received updates not present here. 0079 - "Double Oh Seventy Nine" - Refers to the pivotal year of the Universal Century time line where the One Year War was fought, and the original Mobile Suit Gundam TV series was set. 0083 - "Double Oh Eighty Three" - Refers to a point in the Universal Century timeline four years after 0079, and the OVA series Mobile Suit Gundam 0083: Stardust Memory is set. 1/100 - One One Hundredth Scale: Bandai's consumer favourite Master Grade line comes in this scale, along with other grades such as NG and HG 1/100 though Master Grade is synonymous with 1/100 for most gunpla fans. 1/144 - One One Hundred and Forty Fourth scale: Bandais most heavily populated and highest turnover line High Grade and it's variants are commonly found in this scale. ABaoa Qu - A Zeon space fortress and their last line of defence during the One Year War. Acrylic - Refers to acrylic paint which is water based. AD - Denotes Anno Domini - The Time line used for Gundam 00 Series, and our current time line on Earth today. Alclad/II - A brand of metallic paint popular among automotive modellers for it's high shine and excellent quality. Amuro - Amoro Ray is the original protagonist character from Mobile Suit Gundam, a Newtype that grows to become an Ace pilot. BAKUC/BMKWC - Bandai Action Kit World Cup/Bandai Model Kit World Cup: The former and current name of Bandai's worldwide annual Gunpla competition - the premier event on the Gunpla calendar each year. BB - BB Senshi Sangokuden - a series/line of samurai/knight themed models with oversized heads from the BB Warrior Romance of the Three Kingdoms anime. CE - Denotes Cosmic Era - The Time line used for Gundam Seed/Destiny Series. Many parallels are drawn between CE and UC, though they exist seperately. This was done intentionally to capture new fans to, and also as a respectful nod to the classic storyline. Char - Char Aznable PKA Casval Deikun is the primary antagonist from the original Mobile Suit Gundam and revered as one of the most fearsome and skilled mobile suit pilots of all time. Colony - In most Gundam Universes exist enormous man made habitable colonies populated by humans. Colony Drop - Refers to Operation British, which occurred during the One Year War. The Principality of Zeon forced a space colony out of it's orbit with the intent of dropping it into earth's gravitational pull and causing it to crash to earth and destroy the Earth Federation's main Earth base. Due to an explosion it instead landed on Sydney, wiping out 16% of Australia's land mass and causing earthquakes, tsunamis, and global devestation and famine the world over. Conversion kit - A set of after market plastic or resin parts designed to convert an existing Bandai kit into a variant or other unreleased design. Curing - Refers to the time needed for paints, putties, glues etc to fully cure before they should be sanded, painted over etc. Decals - Refers to markings one can apply to a kit to enhance it's appearance. Can be dry tansfer or waterslide, the former typically being supplied with a gunpla kit, the latter typically being an after market purchase from Bandai or a third party manufacturer such as Samuels. Dendrobium - A massively comprehensive HG kit comprised of the GP03 Stamen and the Dendrobium Assault Weapon. Also available in 1/550 scale. Denubbing - The process of removing the Nubs from the pieces of your gunpla kit. Despruing - The process of cutting the parts of your gunpla kit away from the sprue. Diorama - A custom built setting or scenario that a model is placed in, often depicting a scene or telling a story. EW - Denotes "Endless Waltz", A supplemental OVA occurring after the events of Gundam Wing, or the corresponding gunpla kits which are Katoki designs. Flash - A small unintentional fishscale like piece of plastic on your gunpla parts that is a result of a faulty injection mould. Flash is very uncommon in modern kits but can sometimes be found around fingers or very thin/tapered parts. Floor monster/carpet monster - Refers to the imaginary monster that "eats" your small gunpla parts when you drop them on the floor and can't find them again. To be avoided. Future/FFA - An american product primarily used as floor polish but adapted for use as a clear coat/sealant by Gunpla modelers. Gate - The part of the sprue that attaches to the piece - typically where you will perform your cut when removing pieces from the sprue. Gravity Fed - An airbrush that has the paint vessel on top, thus the paint is fed into the brush by gravity. Gundam Official - North America's official Gundam site. Very infrequently updated it does however contain a wealth of information about time lines and synopses for all of the series therein. 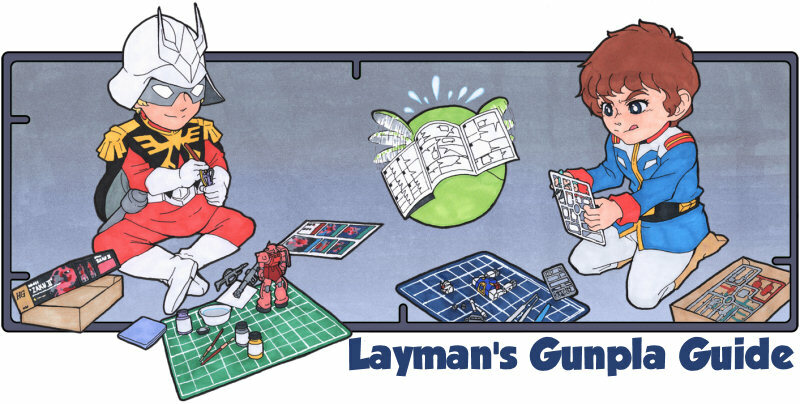 Gundanium - Similar to Gundarium, but from the Gundam Wing AC timeline. Main differences being that it is practically indestructable and has to be artificially manufactured in space. Gundarium Alloy - Technically Luna Titanium Alloy, it was renamed after the OYW in honour of the Gundam. Incredibly strong and light weight material used to construct Mobile Suit armour in the Universal Century timeline. Very expensive to produce due to the difficulty of mining and refining the ore, Gundarium was used sparingly. Gunze - Short for Gunze Sangyo, makers of the Mr. Hobby line of products. Now known as GSI Creos. HLJ - Hobbylink Japan - Online Japan based reseller of Gunpla kits and other hobby related goods. Sponsors of Gundam Australia. Isopropyl Alcohol - A water soluble solvent, typically 98% pure alcohol used to dilute acrylic paint, safely clean and prepare plastic surfaces and more. Iwata - Brand of Airbrush. Very highly regarded. Jeep Style - Defined by Busterbeam as "A type of gunpla style that uses a considerable amount of metal after market parts, with the focus on high mechanical detail." Named after the pioneer of the style or the modeler who made it popular, Japanese modeler 'Jeep'. Katoki/Ver.Ka - Hajime Katoki - Reknowned recluse and mechanical designer extroardinaire, Katoki is responsible for many of the greatest Mobile Suit designs ever put to paper. In Gunpla terms, Ver. Ka. Kits are his namesake and specifically his designs. Reknowned for having a profuse amount of markings. It is said that Katoki became a recluse after being cornered in a toilet by a crazed fan many years ago. Knit Line - A visible but completely smooth line in a plastic piece. During injection moulding plastic is injected through multiple ports, and a knit line shows where the different sources met. Kosutte Ginsan - Literally translated as silver's rub, this is a black powder made from highly refined graphite and other secret ingredients that when applied to plastic and polished can give a highly shined chrome finish. Koto(bukiya) - Make MSG modelling Support Goods and many other brands of option parts and also many different kinds of non-gundam mecha kits. Lacquer - A kind of paint that is typically solvent based. Masking - Refers to the process of covering an area of your model with modeler's masking tape, blu tack, or otherwise to prevent paint from covering that area. Also used to achieve different paint effects such as camouflague and slash striping. Mobile Suit - A mechanized giant fighting robot, typically with arms, legs, and a head from the Gundam universe. 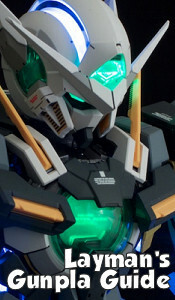 Mods/modding - The process of altering a gunpla kit from it's original shape or design to achieve a different look or greater articulation. Range from subtle to extreme. Moisture Trap - Part of an air compressor that allows moisture from the pressurized air to condensate so that it is not forced through the air line. Monoeye - Single eye camera lens mobile suit. Commonly referring to Zeon units or any unit with a single camera "eye" in it's head. Nub - The small piece of plastic left over on the part after you cut it away from the sprue. Typically shaved down or sanded away. Nub Mark - The mark left behind when a nub is either cut away too deeply or the plastic is torn causing stress and discolouration to the plastic. Can sometimes be removed by sanding. OVA - Acronym for Original Video Animation. A short series, extension, or side story that does not run a full 40-50 episodes like a full series. OYW - One Year War - a pivotal event in the universal century time line and the first major conflict between the Principality of Zeon and the Erath Federation. Several of the Universal Century series/OVA's take place during the OYW. Panel Lines - Lines moulded into the kit to add detail to the armour or denote seperation. Many modelers choose to add extra panel lines to their kit by scribing. Panel lines are often inked with a Gundam Marker or using a panel line wash technique to highlight detail and add depth to a model. PC/Polycaps - Polyurethane joint parts. Typically a soft, floppy grey runner but can be moulded in other colours. Often used in ball and socket connections or pin and hole connections where an amount of flexibility is required. PG - Perfect Grade - Bandai's premium range. Often have a very large number of parts, very high detail, and high articulation. Very detailed inner frames that often are comprised of a frame within a frame. Pins/Rivets - When a modeller adds metal pins or metal/plastic rivets to a kit to enhance appearance. Pla Plate/Styrene sheet - Flat thin polystyrene card used by many modelers to scratch build and add detail. Photo Etched - Saw blades or option parts that are wafer thin, created using photographic emulsification techniques. Pre Shading/MAX - A painting technique involving spraying black over angled edges and panel detail, so that when the following base colour is sprayed over the top it shows up as having darker edges. Helps add depth to a model and used extensively though not pioneered by Max Watanabe. Often referred to as MAX technique. Priming - Spraying a coat of primer. Primer helps fill minor imperfections and provides the perfect base for paint to adhere to. Proportion - Often discussed by Gunplars, proportion refers to the comparitive size and symmetry of a Mobile Suit's various parts and if they are in proportion to one and other. Putty - A product used to fill gaps and sometimes sculpt new shapes. Pliable when wet, it dries hard and can be sanded and cut. Resin - Polyurethane resin is what most garage kits and aftermarket conversion kits are made from. Resin is often coated in an oily substance called mould release agent and needs to be washed in degreaser and then detergent prior to commencing work. Robot Damashii - "The Robot Spirits" - A popular line of Gunpla and Mecha figures by Bandai. Runner - The entire alphabetised rectangular plastic frame containing the parts with which you build your gunpla. Scale - Refers to the size of the model, for example a 1/100 model is one one hundredth of the intended size of the fictional robot. So if a 1/100 model is 18cm tall, its real life counterpart would be 18 metres tall. Scratch Build - To build something from scratch. A piece, part, section, weapon, extension, diorama, or entire model for example. Scribing - The process of carving lines or details into a model using a scriber, needle, awl, chisel, or blade. SD - Super Deformed - An animated series and line of subsequent models with big heads and stubby bodies. Side Cutters/Nippers - A sharp pair of cutters intended for cleanly cutting the plastic gates that attach the parts to the sprues. I always recommend Tamiya Sharp Pointed Side Cutters For Plastic as my favourite. Single Action Airbrush - An airbrush that can only release a combination of air and paint, as opposed to double action airbrush above. Solomon - An asteroid and strategic base for Zeon during the OYW. Sparmax - Brand of resonable quality compressors and airbrushes. Made in PRK. Spray Booth - A booth with a filter and vacuum ventilation designed to facilitate working with your airbrush indoors. Sprue - The passage through which molten plastic is introduced to a mould, so therefore all of the stuff left over on the runner when you've cut out all of your parts. Tamiya - Japanese model paint, supplies, and accessories. Tamiya acrylics are widely available and widely used by Gunpla modelers. Time Line - A period or canon in which a Gundam universe is set. Often unrelated between the Gundam Universes in order to not interfere with the chronology of the earlier time lines. Eg: What happens in the Universal Century and the After Colony era are completely unrelated because they are from seperate universes. Tomino-sama - Yoshiyuki Tomino - Creator and father of Gundam. Top Coat/Gloss Coat/Matt Coat/Flat Coat/Clear Coat - A clear sealing spray. Available as an acrylic spray can in gloss, semi gloss (satin), and matte (flat) in the Mr Top Coat range, as a lacquer gloss (Mr. Super Clear), and as a lacquer flat, satin, and gloss in Tamiya's range (clear is gloss). Turn-A - A Gundam Series set in an alternate universe. May also refer to the main protagonist Mobile Suit. UC - Denotes Universal Century -The time line of Mobile Suit Gundam and many subsequent series (Sentinel, Crossbone, Unicorn, Victory...) Is currently also used to denote things related to Gundam Unicorn depending on the context. Vernier - Bell shaped rocket used for stabilising during flight/space use. V-Fin - The antennae or horns at the front of a Gundam's head is called the V-Fin. Vignette - Like a diorama, but does not include any large pieces of scenery or structures, and is used to give specific insight into a particular event or story. Wash - Refers to Panel line wash. The process of inking panel lines using heavily thinned paint and capillary action. Not to be confused with washing parts prior to construction. Weapons Block - Akin to writers block, weapons block occurs when you have completed the main construction of you gunpla and get to the weapons and lose your motivation to keep going. The only solution being to stall completely or power through. Weathering - The process of making your model look worn, dirty, or used by employing various techniques from adding oil stains, to soot, to dirt, to mud, to chips, dents, scratches, cracking et al. Wing - Refers to the animated series Gundam Wing set in the After Colony alternate timeline. May also refer to the main protagonist Mobile Suit. WIP - Acronym for Work In Progress. Typically used to denote a topic on a forum or a blog post whereby the modeler will be demonstrating parts of the build/modifications/paint. Zeke - Nickname for Zeon soldiers/supporters. Zeta/Double Zeta - Gundam series based in the Universal Century timeline. Continuations of the story and featuring some of the original characters and referencing earlier storylines frequently, but with new antagonists and protagonists.